Status: Uncommon casual irruptive winter visitor statewide. Rare casual breeder and summer visitor northwest. Documentation: Specimen: UNSM ZM10406, 29 Nov 1910 Crawford, Dawes Co.
Summer: This species is not known to breed regularly in Nebraska; the three records of breeding have occurred following significant irruptions. Clark’s Nutcrackers have remained into summer after the 1972-73, 1968-69, 1986-87, 1996-97, and 2004-05 irruptions, although evidence of breeding has been noted after only three of these influxes. Ducey (1988) cited information regarding a begging juvenile in Sowbelly Canyon, Sioux Co in May 1987; this record was reported later by the original observer (Tomback 1995). Although breeding could not be confirmed by another observer (Williams 1987b), the large number of birds involved in this 1986-1987 irruption supported the likelihood that breeding indeed occurred (see also Mollhoff 2001). A single bird first noted in Morrill, Scotts Bluff Co 8-9 Jan 1997 following the 1996-1997 irruption was paired during the second week of Feb and a young bird with brown feathering in its wings was noted at a feeder 7 May; at least one bird remained until 4 Jun 1997 (Mollhoff 1997). Following a large incursion in winter 2004-2005 of as many as 50 birds, seven in Monroe Canyon, Sioux Co were showing courtship and nest-building behavior (Stephen J. Dinsmore, personal communication); later visits in Jun found no evidence of breeding success, however, probably from a shortage of food due to a cone crop failure in 2004 (Mollhoff 2005). Other breeding season reports without evidence of breeding and following irruptions were of four in Monroe Canyon 25 Jun 1973 (Rosche 1982, Williams 1973a) and several in the Wildcat Hills of Scotts Bluff Co in summer 1969 (Gates 1970). Additional isolated reports from Sowbelly Canyon 24 Jun 1999 and 16 Jul 1994, and 18 Jun 2006, as well as nearby Pants Butte Road, Sioux Co 12 Jun 2008 were also unaccompanied by any evidence of breeding. Eruptions, generalized movements of significant numbers of birds from the breeding range, apparently occur when population densities are high and food availability is limited (Tomback 1998). The best Nebraska example of an irruption occurred in fall and winter 1986 when breeding ensued, but the population later dwindled and eventually disappeared. 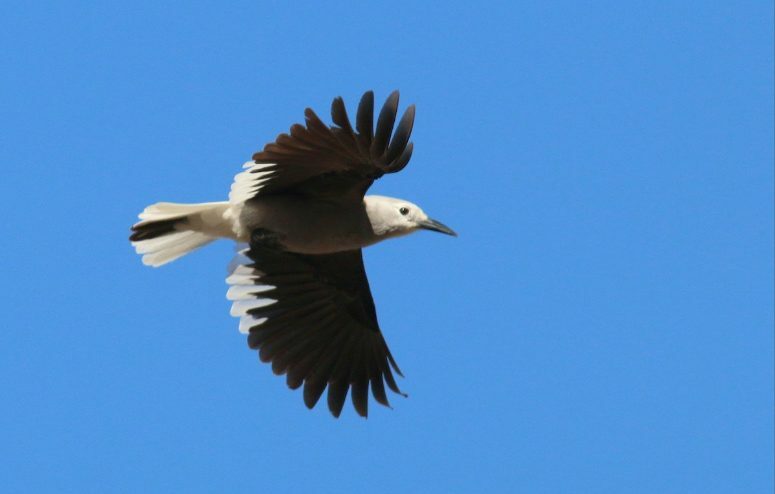 Clark’s Nutcracker is a rare resident of the South Dakota Black Hills, but there are virtually no records elsewhere in that state (Tallman et al 2002), suggesting that birds appearing in Nebraska follow the North Platte River Valley from Wyoming, where breeding occurs as close as 40 miles from Nebraska. This eruptive montane species has been reported at least 55 times. Many of the reports are from ponderosa pine habitat on the Pine Ridge and in Scotts Bluff Co, and the major irruption of 1972-73 provided most of the remaining reports away from those areas (as in Kansas, Thompson et al 2011). A single bird, an early indication of the Pine Ridge irruption to follow, was as far east as Lincoln Co 30 Aug 2004 (Brogie 2005). Single birds appear in non-irruption years on rare occasions, such as one in Sowbelly Canyon 30 Aug 2003, one near Orchard, Antelope Co 9 Sep 2007, one at Sowbelly Canyon 20 Sep 1992 and another there 22 Sep 2013, one at Lake McConaughy, Keith Co 1 Nov 1998 (Dinsmore 1999a, Brogie 1999), and one at Morrill in early Nov 2001. Notable was a large flock of 50 in Sioux Co 19 Sep 1979 in the non-irruption winter of 1979-1980 (Sharpe et al 2001); A flock of 15 was near the Wildcat Hills NC in Scotts Bluff Co 18 Feb 2018, and a single was in the same area 23 May. Significant irruptions occurred in the winters of 1919-20, 1933-34, 1950-51, 1968-69, 1972-73, 1973-74, 1986-87, 1996-97, and 2004-05. Easterly reports are 29 Sep 1972 Sarpy Co, 6 Oct 1955 Merrick Co (Galloway and Galloway 1956), Superior, Nuckolls Co 10 Oct 1933 (Johnston 1933), Wayne Co 30 Oct 1972 one that died 4 Nov and is now a specimen WSC 67 (Rasmussen 1973), early Nov 1972 at Louisville, Cass Co (Williams 1973b), and 18 Feb 1951 Cass Co (Heineman 1951). Curiously, none were noted in the east in the irruption winter 1996-97 when three appeared in Iowa. High counts: 71 in Sowbelly Canyon 7 Feb 1987 (Williams 1987a), a flock of 50 just east of Sowbelly Canyon 19 Sep 1979, and 40-50 near Sowbelly Canyon 5 Feb 2005. Photograph (top) of a Clark’s Nutcracker at East Ash Creek Canyon, Dawes Co 25 Nov 2017 by Aaron Brees. Galloway, S/Sgt., and Mrs. Galloway. 1956. Excerpts from letters to the editors. NBR 24: 16. Gates, D. 1970. Clark’s Nutcracker. NBR 38: 17. Heineman, L. 1951. Winter notes from Plattsmouth. NBR 19: 49-50. Johnston, H.C. 1933. The Clarke Nutcracker at Superior, Nuckolls County. NBR 1: 130. Mollhoff, W.J. 1997. A probable nesting of Clark’s Nutcracker (Nucifraga columbiana) in Nebraska. NBR 65: 147-150. Rasmussen, R.L. 1973. Clark’s Nutcracker. NBR 41:43. Tomback, D.F. 1995. A possible breeding record for Clark’s Nutcracker in northwestern Nebraska in 1987. NBR 63: 114-115. Williams, F. 1973a. Southern Great Plains Region. American Birds 27: 886-890. Williams, F. 1973b. Southern Great Plains Region. American Birds 27: 78-82. Williams, F. 1987a. Southern Great Plains Region. American Birds 41: 297-300. Williams, F. 1987b. Southern Great Plains Region. American Birds 41: 1455-1458.